THIS WEEK’S TWO OTHER FEATURED BOOKS, “TO THE LEFT OF THE MICROWAVE,” BY LISA DE NISCIA AND “OPERATION CROSSBOW,” BY WILLIAM DELOREY, CAN BE FOUND BY SCROLLING DOWN BELOW THIS POST OR BY CLICKING ON THE AUTHOR’S NAME ON OUR AUTHOR’S PAGE. THE EDITOR: Jerry Gold, also an author and retired Green Beret. I particularly recommend Sergeant Dickinson, one of the finest novels to come out of the Vietnam War. SUMMARY: The Blue States have seceded and formed their own union following a disastrous US invasion of Denmark. It’s one of several conflicts being waged by a zealous Red Zone government in Washington that reportedly dispatches press gangs to fill military ranks while its citizens flee to Mexico seeking employment as domestics and busboys. Tossed into this maelstrom is ghost writer Delmore LeCorte, who becomes romantically entangled with both the Red Zone president and her more astute sister. 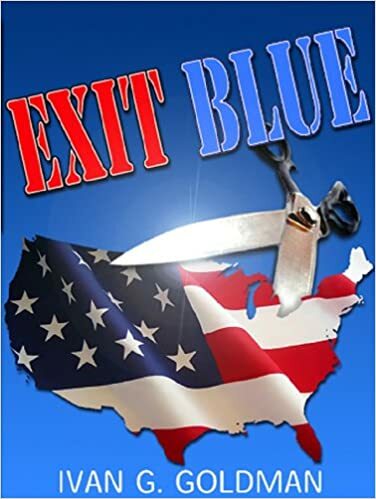 It’s left to the reader to decide whether Exit Blue is political satire or a prescient look at what lies ahead. THE BACK STORY: Much of my research involved shouting back at TV news and scribbling ideas on bar napkins. WHY THIS TITLE? : Imagine what happens if the Blue States ever decide they’ve had enough. WHY WOULD SOMEONE WANT TO READ IT? It’s election time. Besides, if you get hit by a bus and you’re still breathing, the best thing to do is laugh. “‘a humorous and sometimes frightening look at what America could become.” — Midwest Book Review. AUTHOR PROFILE: I once made the New York Times best-seller list and immediately took my family to tour Europe, figuring we were now rich. When we returned two weeks later there were lots of bills and my book had fallen off the list. I was born and raised on Chicago’s South Side and now live in Rancho Palos Verdes, California. I covered Congress for The Washington Post and worked at the National Desk of The Los Angeles Times. This is the third of my five novels.
. If you’re not interested, that’s okay too. WHERE TO BUY IT: Amazon, Barnes & Noble, straight from the publisher and at select, tasteful bookstores around the planet. CONTACT THE AUTHOR: ivan.goldman@gmail.com and @ivan_goldman on Twitter.